Increase Your Wealth By Paying Homage to Yellow Dzambhala! | Sana Ako si Ricky Lee! A few blogs ago I mentioned about how Christians look at money as the root of evil. Although no one wants to be poor, in a very strict Christian perspective, poverty is almost welcomed. In fact, it is thought that a suffering, problems that includes poverty is actually a test from God. Please be assured though that I’m not anti-Christianity and neither am I criticizing the religion. I’m simply stating a fact and it’s not necessarily bad, it’s just that I don’t really understand this. However, I believe poverty is an obstacle to understanding and learning the Dharma (Buddhist teachings). How can one have the time and strength to practice the Dharma if one needs to work really hard for money, if you have nothing to eat, if you need to survive, if you need to think about the survival of your family? I’m not saying is that wealth is the only thing that can keep a person from pursuing the Dharma or for Christians the word of God. There are a lot of other factors most basic of which is desire. The desire to gain wealth is different from being worldly. The truth is there are worldly people who are not even rich and there are rich people who are really very unworldly. There is nothing wrong with wishing to be wealthy, what is wrong is how you handle wealth. In Buddhism, one is safeguarded from being too greedy by its basic teaching of karma. Buddhist people knows that what they do now will have repercussions either in the immediate future or in their next life. Taoism, Buddhism, and Hinduism all have Wealth Gods, and this greatly shows that they are confident with wealth and that this is not necessarily evil. 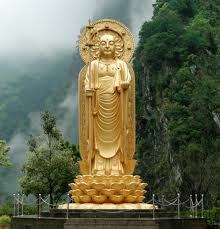 Allow me to ‘introduce’ you to one of the most revered wealth deity in Buddhism – Yellow Dzambhala. 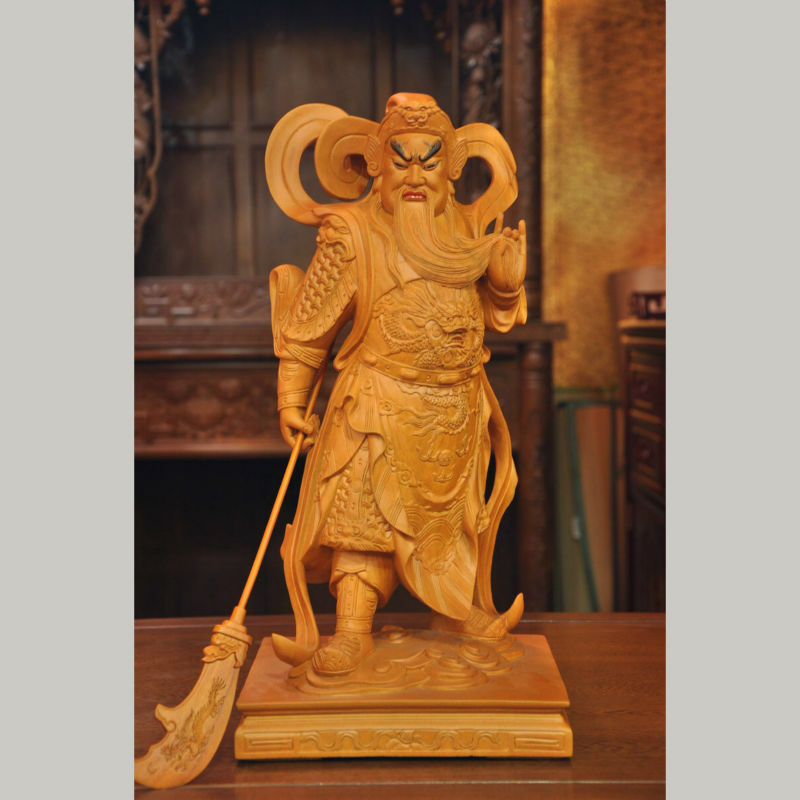 In truth is there are different kinds of Dzambhala (also spelled as Jambala, Jambhala, Dzambala, Zambhala, Zambala), but the most famous one is Yellow Dzambhala, some say that he is the most powerful one. 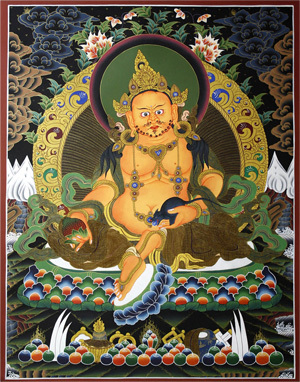 Yellow Dzambhala is pictured as a rotund or plump male bodhisattva. He usually has ornaments typical to that of the Bodhisattvas. His Buddhist practice, rituals, and mantras are said and done specifically for the purpose of gaining wealth. 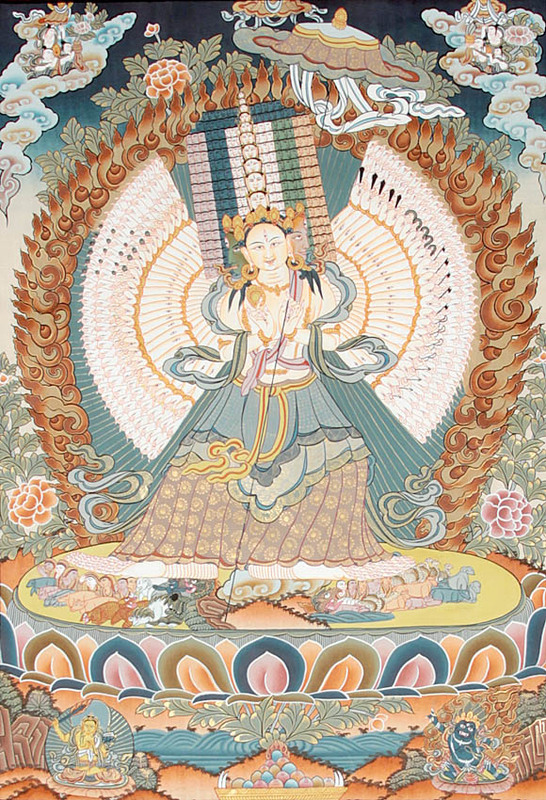 All Dzambhalas are said to be the wealth giving form of Avalokitesvara, this means they originally emanated from Avalokitesvara or the Compassionate Buddha. 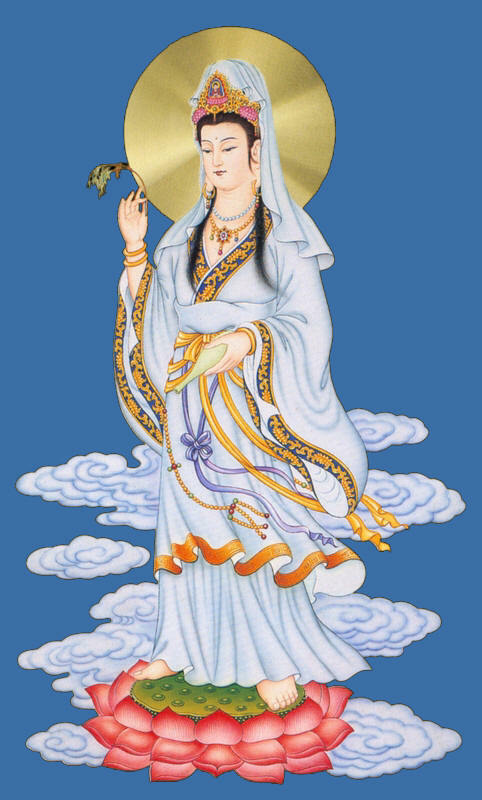 Avalokitesvara is also known as Kuan Yin. 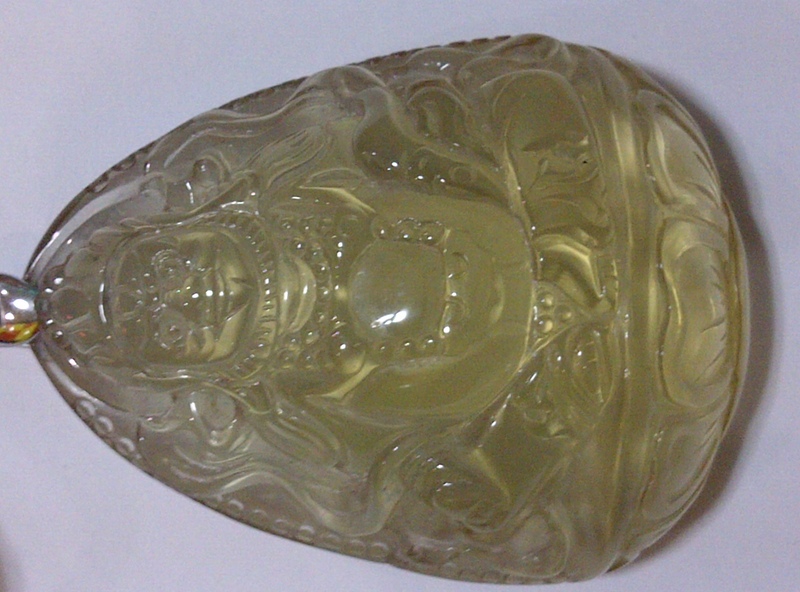 It’s considered auspicious to invite the image of the Yellow Dzambhala in your home or office. Every morning, you can also pour some fresh water on top of the head of Yellow Dzambhala with your right hand, while you chant his mantra 7 or 21 times. You can also chant the mantra of Yellow Dzambhala 108 times a day; this is to tap into his blessing. When I was just starting my business, I would always chant his mantra everyday, and because of it, clients started coming in. The mantra of Yellow Dzambhala is OM DZAMBHALA DZALIN DRAYE SOHA. You can also wear the Yellow Dzambhala’s image as a pendant. Like I always say, fashioning an image of a Buddha or Bodhisattva or Deity or Immortal into a sacred jewelry is like paying homage to them. On top of that by wearing their image you’ll also able to continuously tap into their blessing. I was lucky to get an image of Yellow Dzambhala made from a semi-precious stone – Smoky Citrine. This is from my private collection and is made of Smoky Citrine. I was just lucky to get this on ‘bargain’. This is about an 2inx1 1/2in. However, I also recently was able to request my jeweler to fashion for me a sacred jewelry that has an image of the Yellow Dzambhala, but other than the Yellow Dzambhala it also has the image of the Medicine Buddha, Kuan Kong, Kalachakra Symbol, and the short mantra OM AH HUM on the front. At the back are the mantra or sacred syllable of the Medicine Buddha, which is TADYATHA OM BHEKANDZYE BHEKANDZYE MAHA BHEKANDZYE BHEKANDZYE RADZA SAMUGATE SOHA, it also has the Wish Fulfilling Mantra – OM PADMO USHNISHA VIMALE HUM PHAT, and the Negative Karma Cleansing Mantra – OM HANU PHASHA BHARA HE YE SOHA. 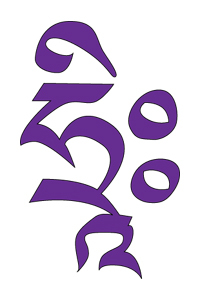 Furthermore, it also has the seed syllable of Goddess Green Tara – TAM whose full mantra is OM TARE TUTTARE TURE SOHA, the Victory Banner which is a powerful symbol for you to achieve success and overcome obstacle, and the Lung-Ta or Windhorse which is a powerful tool to achieve success through wisdom. For those who career, business, and financial advancement, the Windhorse is powerful tool. I’ve talked about this pendant in a previous post, and was thinking of calling it FULL MANTRA PENDANT then, however, in hindsight it’s not an appropriate name. I would also have wanted to include the Yellow Dzambhala mantra, however, considering its small, it would be too crowded, and so I made the decision to take out the mantra of Yellow Dzambhala. This is the second pendant that I’ve designed. The first is WEALTH AND MASTER PROTECTION PENDANT, while it’s a great wealth enhancer; it’s really more of a protection pendant from negative energies and also from the effects of the Bad Flying Star. 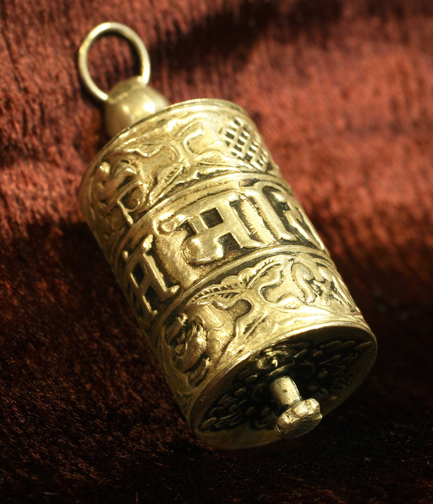 The second pendant that is called WISH FULFILLING AND BUDDHA’S BLESSING MANTRA PENDANT is more of enhancing wealth, good health, business luck, and career luck. Furthermore, it has the Negative Karma Cleansing Mantra that also helps enhance your chi for you to be more receptive to the blessings of the Buddhas or Bodhisattvas. ← Fulfill Your Wishes and Get Blessings from the Buddhas with the ‘Wish Fulfilling and Buddha’s Blessing Mantra Pendant’. This is good information but my question is do you have to be an Buddhist to receive the blessing from this Buddha? Cause I just purchased the mantra ring for this Buddha and I would love to know all I have to do is chant the mantra to receive the blessings. This is incorrect and ignorant of you. Perhaps you should read the bible before making such comments, and consulting a preacher of the word (holy bible) rather than make assumption based on hear say. The bible verse actually state’s very clearly that the love of money is the root of all evil. Money is not evil in itself, or God wouldn’t have blessed His people over and over again with it. Abraham, who is our father through faith, was filthy rich. To say that money is evil, is to say that God gave Abraham much evil. The streets in heaven are lined with gold; so if gold was evil, then heaven’s streets are lined with an evil substance! If we look in Deuteronomy 28, the famous blessing and curses chapter, we learn that having an abundance of money is considered a BLESSING or a GOOD THING! It is in no way evil for a child of God to be financially blessed. Thank you for sharing your thoughts and for clarifying. Will look into it. Apologies if I offended you with this post. In regards to the transliterating the Negative Karma Cleansing Mantra – OM HANU PHASHA BHARA HE YE SOHA, is the PH is PHASHA pronounced like the english F or is it more like a “PUH” sound? Hi JP, I would like to chant those mantras, Im a Filipino and getting a hard time chanting those words. Is there anyway that I can chant them in english? The answer to your question is that there is no english translation. I’m also a Filipino of Chinese descent and I don’t really speak Tibetan, but practice makes perfect. Sorry, i don’t have a website but you can email me. The Wishfulfilling and Buddha’s Blessing Mantra Pendant? Email me. Namah Shivay, Happier New year 2013.I read blog & I enjoy very much.Please let me price of yellow smoky Dzambala pendant. Namah Shivay, Happier New year 2013.I read blog & I enjoy very much.Please let me know price of yellow smoky Dzambala pendant. Thanks a lot for reading my blog. For the Smoky Citrine Yellow Dzambhala pendant, I don’t know where you can get it. From what I know there are only 5 of that that wwas made. I have 2 of them with me. I don’t know where the other 3 went. If you’re really interested, please email me directly at sanaakosirickylee@gmail.com. My husband had just invited a Yellow Dzambala home and puts it under a water feature whereby the water keeps running down on the deity’s head from morning till night. Is this okay or should we just pour water over its head whenever we want to chant the mantra? It’s ok to hav some water continuously flow over your Yellow Dzambhala, but I suggest that you recite His mantra in front of the image. Thanks for your kind advice. Yes, we do recite His mantra “Om Dzambala Dzalin Draye Soha” in front of the image, in the morning and again at night (one mala each time). The rest of the time, we just allow the water to flow continously. Is this okay? And can we make some wishes after or before chanting His mantra? Why are you so defensive and angry? What Jp has said is not incorrect. there are many Christians who thinks the pursuit of wealth is evil. Here is another verse from young bible, its eaaier for a camel to pass through a needle eye than for a rich man to enter into zion. Although I’m not a Christian i was raised by Christians and has been around Christians all my life so i know what I’m talking about. i remember working with one Christian woman who said she only worked half of the day because according to her denomination she’s not to acquire more wealth than necessary. And what are you doing on a buddhist blog, Christian extremist. and matter of fact, it you who is pursuing incorrect jibberish and obviously you haven’t spoken to a pastor/priest of the various denominations amongst. can you say confused much. why are the Amish, catholic priests, and other xians aren’t busy acquiring wealth? go to any YouTube video about a wealth/money mantra anf you will see Jesus freaks proclaiming that its wrong to acquire wealth, along with the attempts to convert people. makes you wonder why xians are so unaccepting of other belief system and the fictional Jesus is not the way truth and light is not for everyone. based on this fact, this blog is not for you. Stick to Jesus. and like i said save it because i was raised by xians but chose my own path. Your sentiments about xians are not incorrect. i was raised in a xian home and has been around xians all my life so I’m use to hearing what you said from xians. It is Brett who needs to stop his denial or become more informed. I see teleevangilists on tv justifying totheir sheeps why they pursue wealth. Brett quoted the old testament but according to the new testament render unto Caesar what is due unto Caesar meaning money. and if the people brett mentioned from the bible like Abraham was not an xian because xian came much later. Abraham was not a Jesus follower Jesus was mentioned in the new testament. i know he will deny this along with the fact that Jesus was manufactured at the counsel of nicea to tame barbarians. And The various denominations interpret the bible differently. Where is the perfect place to keep a Yellow Dzambala idol at home ? If you have an altar, then the altar. Hi Ricky, may I know how much is the citrine Dzambala? Is it natural stone or synthetic. 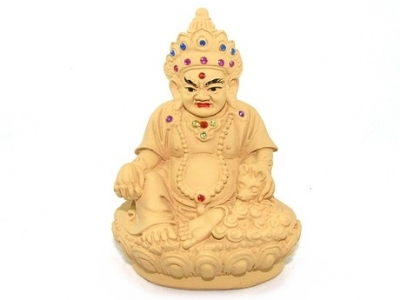 I’m also looking for a Medicine Buddha pendant. Hope to hear from you soon. Thanks. Namaste. Id like to avail of this wish fulfilling and buddha’s blessing mantra pendant of yours. Kindly send me the details on how to purchase this valuable item with its amount on My email. Ill be happy to hear from you soon. Regards.